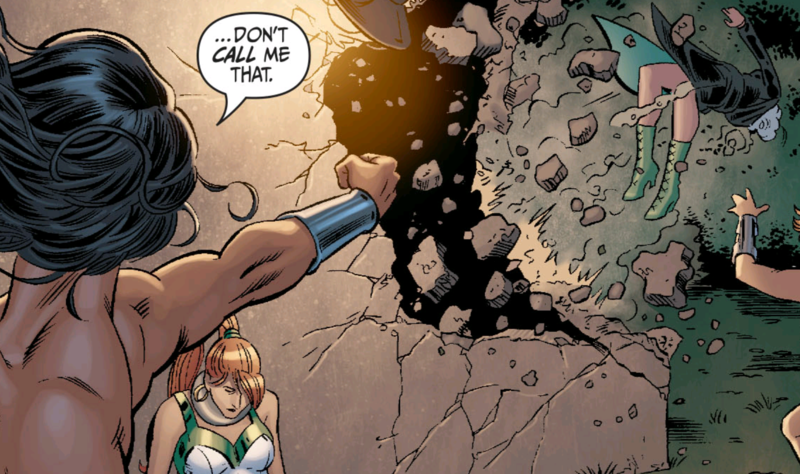 Imagine for a moment being on Wonder Woman’s bad side. And then she shows up unexpectedly to have a little talk with you. Cue awe and soiled garments. Beginning in issue #10, the Six ended up working for the vile Mr. Smythe, whose vision of a better society included slavery and the construction of a prison for every felon on the planet. One of Smythe’s captives was Artemis (oops), whom Jeanette freed in issue #11. But when Wonder Woman arrived in the final page of that issue, all she saw were some guilty-looking mercenaries hovering near her unconscious sister. “Which one of you miserable swine killed my sister?” she asked. “The Depths” should be read in its entirety, but the showdown between Diana and the Six in issue #12 is fantastic by itself. Simone and Scott never let us forget that in addition to being an incredibly powerful being who doesn’t put up with stalling and nonsense, Wonder Woman is freaking royalty. Jeanette, interpreting Wonder Woman’s attitude as hauteur, referred to her as an “arrogant creature” and simply, “Amazon.” Diana didn’t like that. The bullets and bracelets thing? Real. Deadshot went there anyway, and this happened. Jeanette got a good lick in, but when Wonder Woman tells you not to call her “Amazon,” you shouldn’t try it a second time. I’ve always been a fan of the way Nicola Scott illustrates Wonder Woman, and she provided some stellar panels — my favorite being the one from Jeanette’s perspective as Diana hoisted her above the ground and demanded to know where the other Amazons were being held. This is not a vantage point I’d ever want to have in real life. The battle between these two very different characters is really something to see, because Jeanette seemed to be the only member of the Six who wasn’t afraid to challenge Diana, even in the middle of a very lopsided brawl. Finally driven over the edge, she transformed into the Banshee and unleashed such a horrible sound that Wonder Woman was left dazed and foaming at the mouth. Later on, Mr. Smythe attempted to serve the temporarily captured heroine as a meal for the demon Grendel to devour in the prison’s lower depths. Grendel assumed he had time to play with his food in issue #14. Nope. Though Wonder Woman and the Six were worlds apart, this dark and wholly satisfying story allowed all of the players to be great in their own way and to right wrongs as they saw fit. Diana shines, and re-reading these issues made me miss the Secret Six series something terrible. 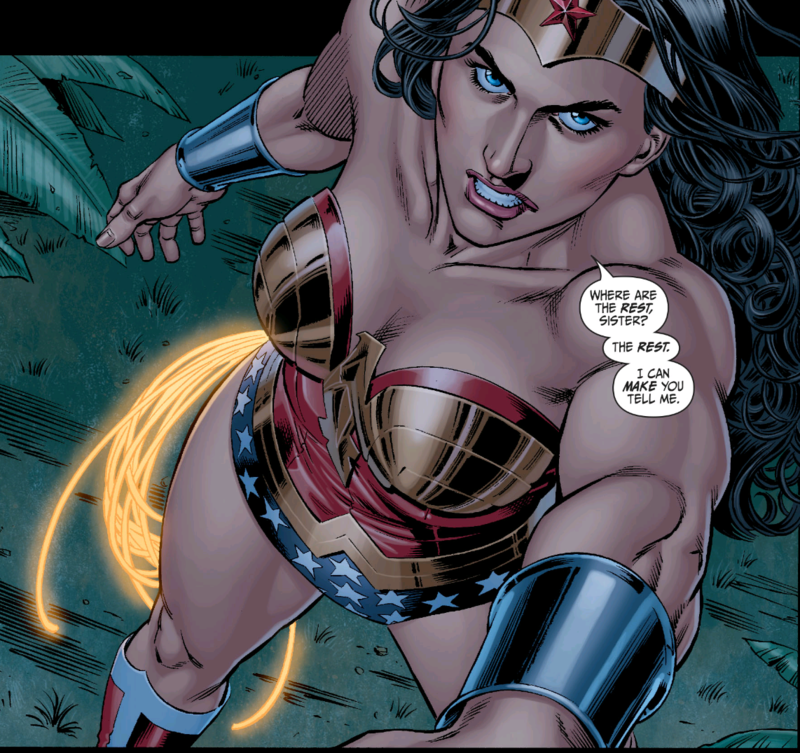 This is the third installment of our “Wonder Woman Is… ” series where we talk about when creative teams got Diana right. You can read the the first one here and the second one here. This is rather way nifty! I have never read the Secret Six and alas they are no more, but seeing this and the way Diana should be in all of her awesome was a treat. 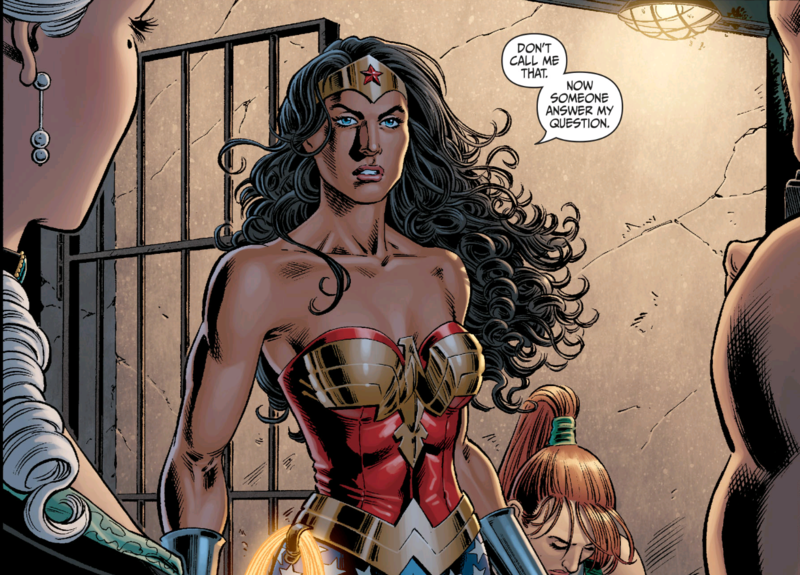 But it was a tad bittersweet because it just reminds me of the insipid version of Diana and WW that we are ‘gifted’ with at the moment under the New 52. Yep, I remember that Secret Six arc. There is quite a lot of fresh discussion right now on women and comics in connection with what Janelle Asselin had to say and the disturbing furor is cause. I totally stand by what she has to say! You may enjoy my interview with Tim Hanley that I just posted on my blog. We discuss a number of very relevant issues. Putting this on my to read list immediately. And I agree, Scott illustrates Diana beautifully. I love that frame of her sending Deadshot flying using only 2 fingers.